Wow everyone! Thanks for the comments and votes on this entry! I wasn't expecting this photograph to do very well, it was kind of a last minute shot with my daughter's pet mouse. Anyways, I am quite pleased with the result in the end! Congratulations on your red ribbon! Congratulations! Well done, I loved the clarity and overall simple setup. Love it Love it Love it!!!! I really like how you got the little guy's foot in the picture. The mouse is so cute! Congratulations on a well deserved ribbon! The colors are great in this one. It really stands out from the crowd. Great Shot! Congrats on the Red Ribbon! He, he, this is cool - congratulations! Congratulations on your ribbon. Your entry was fun and well done. Great job. Excellent! Congrats on your red! Hey Congratulations on your RED ..
Congratulations: I thought this was just so precious. I think the little toes just visible under the plate just make the shot! Had this picked for top 3, what a fun and well captured image. Man oh man... look at you. Great job! Mike, you TOTALLY ROCK! This is the cutest thing I've ever seen. . .besides all the other cutest things I've ever seen of yours and Laurie's photo :) Mega congratulations on the red ribbon! This is awesome! Congratulations! This was a great shot, wonderfully done. A well deserved ribbon. Message edited by author 2007-02-07 00:07:39.
the angle you shot this from is very interesting. i like the way the front of the plate is out of focus, so it creates more interest on the mouse and food. i also love the variety of colors played out in the image, very nice job! The angle is great. Good picture. Clever idea but it would be even better if the plate was in focus. Such a fun creative shot. It's so nice of you to remove the crust for your mouse! The horizon is a little tipsy and there is some halo on the border but who cares...back to bump you up to 9. Awwww! This is really nice composition. The big thing I would change that would have probably done better for this image is a flatter plate. The curve of the plate and it being OOF is distracting. Here's to another ribbon in your profile! :D Cute pic and very well done. Nice idea, nice execution! And very cute guest. ew! nasty. nice DOF and use of the theme. 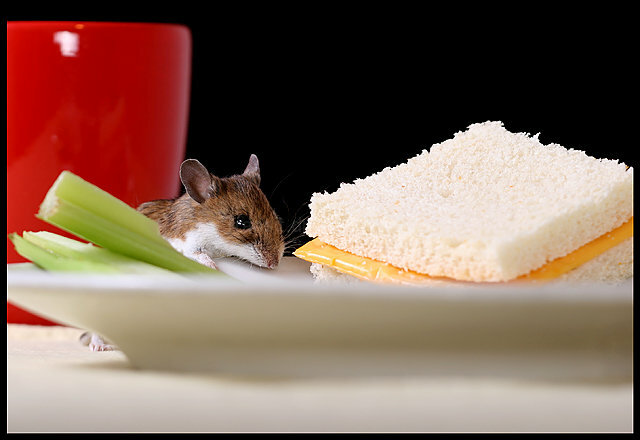 I assume this is a pet mouse, and it looks like he could be having a feast! Nice shot! this photo is very awesome i like the uninvited guest it looks like he is ready to chow down. This photoograph is excellent. I love it. The composition is perfect. i like how the subjects are in focus.the colors are bright and drag your eyes throughout the photograph. it's good. And a cute one too! Very simple setup, I like that.. Proudly hosted by Sargasso Networks. Current Server Time: 04/20/2019 12:15:40 AM EDT.